The Smart-UPS SC 450VA 1U Rackmount/Tower (120V) from APC is a professional uninterruptible power supply designed to prevent blackouts, brownouts, sags, and surges from reaching your valuable equipment. It filters small utility line fluctuations and isolates your equipment from danger by internally disconnecting it from the utility line. When disconnected from the utility line, power is provided continuously from its internal battery until normal or safe conditions return or the battery is fully discharged. The unit also supplies battery-powered AC. 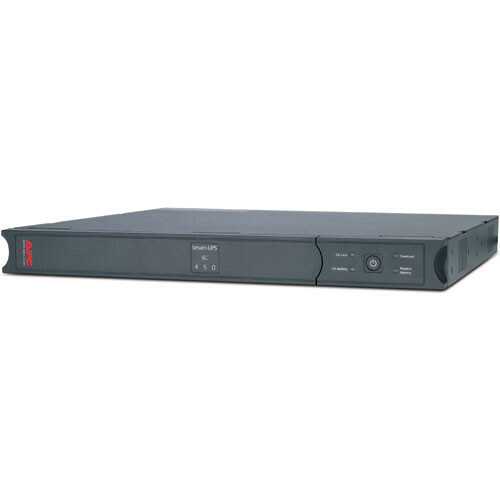 The UPS can be used in a tower or rackmount configuration. Front-access servicing also makes it easier to manage. This unit also offers RS-232 connectivity. It includes a $150,000 equipment-protection policy. Box Dimensions (LxWxH) 23.0 x 19.0 x 6.2"
Smart-UPS SC 450VA 1U Rackmount/Tower (120V) is rated 4.6 out of 5 by 19. Rated 5 out of 5 by SomeGuy from It is a battery Did I win? Rated 3 out of 5 by Architect from Not network manageable Even though the documentation under manageability states that it is network manageable it is not and can only be managed through DB9 rs232 serial. Rated 4 out of 5 by Anonymous from Good product for cost We deployed some of these to use at our switching closets. They have nice configurations like being able to turn off the alarm when it loses power since some of these are near living quarters. The rack mount capability is nice to keep the closet organized. The only thing that I see is that it doesn't have the capability to email messages on certain statuses. Rated 4 out of 5 by whatever from Great UPS but......... Great Smart UPS. Well made and easy to replace the battery. Only negative comment is theat because most new computers do not have a RS-232 (serial) connector, the features offered by the software are obsolete and useless.